Tom Hardy and Christian Bale, as Bane and Batman. Though the Dark Knight Rises is not a bad film, it is decidedly a mixed bag. There are some great moments, but some gaping flaws that cut it off at the knees and keeping it from, well, rising to great heights. It seems this series is really only as strong as the villain in each film. And while no one should compare Tom Hardy’s Bane to Heath Ledger’s career-defining Joker role, it’s hard not to miss him here. 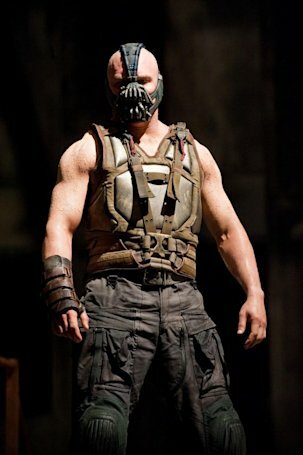 Bane is largely a one-dimensional, overly grandiose “super villain” in this film. The staunch realism of Nolan’s earlier work evaporates when he’s on-screen, making this film feel like the most “comic-booky” of the trilogy. He often seems two steps away from tenting his fingers a la Mr. Burns and cackling maniacally. Fear me, for I am The Mumbler. But even this is overshadowed by his voice. Even with the reported vocal overdubs, Hardy is sometimes completely impossible to understand. He mumbles through his mask in some ridiculous faux-British accent through the entire movie, and it gets irritating by about the second scene. At times, it almost sounds like he’s doing a bad, drunken Yoda impression through a tin can. Dealing with Christian Bale’s Batman voice for three films was bad enough, but with two of them, it all becomes too much. The rest of the cast is seemingly on point. Michael Caine reprises his role as the best Alfred Pennyworth seen on film, and Morgan Freeman is once more solid as Lucius Fox. The two play well as Wayne’s “father figures,” though it is a shame that Caine all but disappears for the second half of the film. Anne Hathaway proves to be a serviceable Catwoman, though her role is largely inconsequential. The film wouldn’t lose much was she written out of it. Gary Oldman and Joseph Gordon-Levitt are both spot on as the heart of the police force. If Inception hadn’t totally proven that Gordon-Levitt was ready to step away from Tommy from Third Rock from the Sun, this film cements it. There are some pacing and transition issues throughout the film, leaving it feeling a little stilted and disjointed. Some scenes — Bruce’s sudden return to Gotham for the final act being a fine example — feel rushed, as if a lazy way to get a character from point A to point B, simply to push the plot forward. The occupy analogy that runs throughout much of the film seems a little odd and forced, too. One almost expects Bane to start shouting, “We are the 99 per cent” at any given moment. How does Batman escape a six mile blast radius at the last second at the end of the film? Why does no one seem concerned by the residual radiation that would surely pound Gotham after a nuclear bomb goes off close by? Why is Bale using his famed Batman voice around people who know his secret identity? How does the world’s greatest detective not manage to deduce that knocking Bane’s mask off wouldn’t have some sort of adverse effect on him? Who on earth thought it was a good idea to have Liam Neeson appear in a vision a la Obi Wan and impart a major plot point Bruce surely couldn’t have known otherwise? Since when is the cure for a slipped disc to string someone up on a piece of rope and to punch them in the back? All of these things might seem moot in a series like The Avengers, which assumes audiences have to take a leap of faith to swallow the entire premise. But in this world, it just seems incredibly out-of-place. This is not to say the entire film is terrible, because it isn’t. There are some great action set pieces, and the last 45 minutes are largely very entertaining, at least in terms of a visual spectacle. It’s also nice to see Bale finally face an opponent that can stand up to him physically. The fact that these two can actually brawl is a nice touch that was missing from the other films. The Dark Knight Rises is not a bad movie. But it follows the best comic book film of all time, casting a shadow so large that anything would probably seem inferior in comparison. It steps out of world that feels real and grounded and flounders around in traditional superhero tropes — something that really hurts it in the end. When the first “new” Star Wars film came out, and for some reason, the film started with a “tax blockade”… with Jedi’s arriving to negotiate… um… taxes… I knew immediately knew there was a problem. In this movie, when it became clear the core narrative revolved around an “occupy” style, “have vs have-not” concept (which like in Star Wars, became convoluted and senseless almost immediately), I had the same feeling. Thankfully, unlike Star Wars I, this movie recovered to be not terrible, but given it’s lineage, is certainly disappointing and mediocre. To your points… i can forgive the voice in uniform (perhaps he needs to be in character all the time while in uniform to be sure he doesn’t slip up at other times). I can also forgive the mask thing (superhero stuff always has some illogical stuff like that that). For example, Batman refusing to use a gun in a situation where a man is planning to literally kill millions of people… is just stupid. But its Batman. He won’t use a gun. Fine. I also know how he escaped the blast radius. He had Indiana Jones’ fridge in his plane (thanks for that too George Lucas). My biggest issue… aside from the lame “occupy” narrative… is that a nuclear bomb story is just lazy. Can you think of a more cliche “suspense building” mechanic than a bomb going off? Sure… the movie is “exciting” at the end as the clock clicks down… because yeah… a big bomb is going to go off. Yawn. You put it very well… there were good parts, but I don’t think its just by comparison to its predecessors does this movie flop. It’s a decent action movie that could have, and should have, been much better. I have to agree on the bomb being a pretty damn lazy narrative tool, too. As for Batman not using a gun – he actually does pretty recently in the comics. How did the city survive and react to a hostile take over for 5 months? So Bruce has been hulled up in his house, perfect time to cover everything in plastic? Can catwoman really get that motorcycle up to where batman and bane were fighting? Hundreds of cops and no one shoots bane in the face? falling 50 feet and having a rope snap you in half doesn’t effect your newly repaired back? Since no one knows how to arm a nuclear device or even if a nuclear device is armed, why didn’t old russian dude just not really arm it? A stab in the back stops batman from beating the crap out of a girl? I know its a comic book movie, but c’mon son. I didn’t realize a city could go for months and not need any food or other supplies. And bloody hell… isn’t Gotham supposed to be Chicago? The whole design of Manhattan (strict grid system, no back alleys etc) is not in any way reminiscent of what Gotham City is supposed to contain/feel like. We could identify hundreds of these sorts of things… but its a superhero movie, so we usually cut slack in order to allow the movie to be as fun as possible. Which is why its important that the movie is allowed to have a narrative based on economic equality… you know… for the fun. Batman escapes the blast radius because he wasn’t actually flying the Bat Wing. He fixed the auto-pilot. Fox discovers this at the end of the movie. I could buy that – except they show him in the cockpit with five seconds left on the clock.